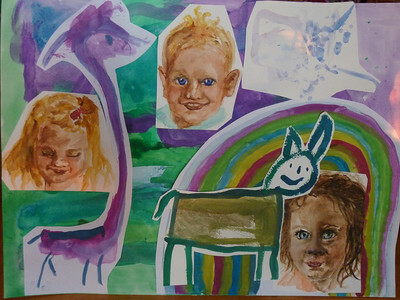 Artists and their illustrations (left to right): Kató (3) purple giraffe, Gyuri (1) he didn't tell to us, but he ate the gouache, Kinga (5) dog and rainbow. Kinga painted the background. October 4th is world animal day. The winner paintings will be taken to the front wall of the nursery school.